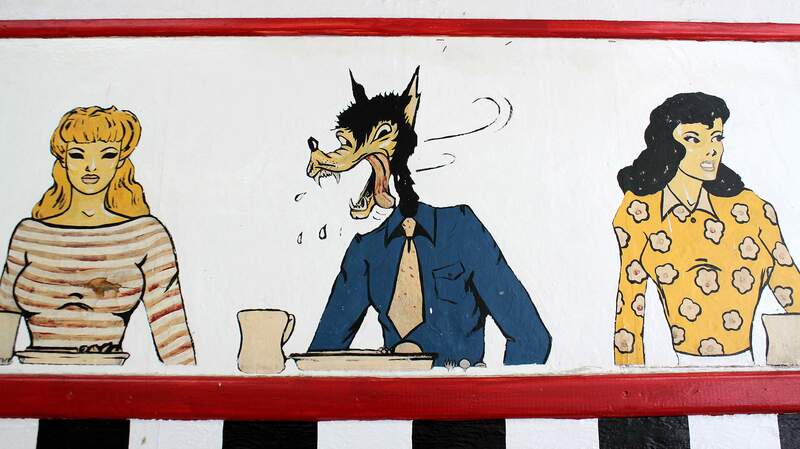 Perhaps the most beloved mural at Mama’s Deli in Salida features a “wolf” on the prowl for girls. 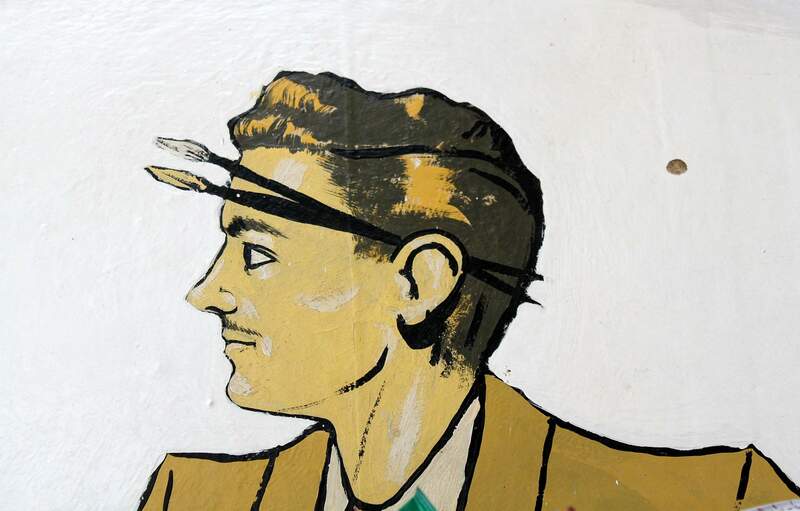 The mural is vintage 1940s American popular culture. 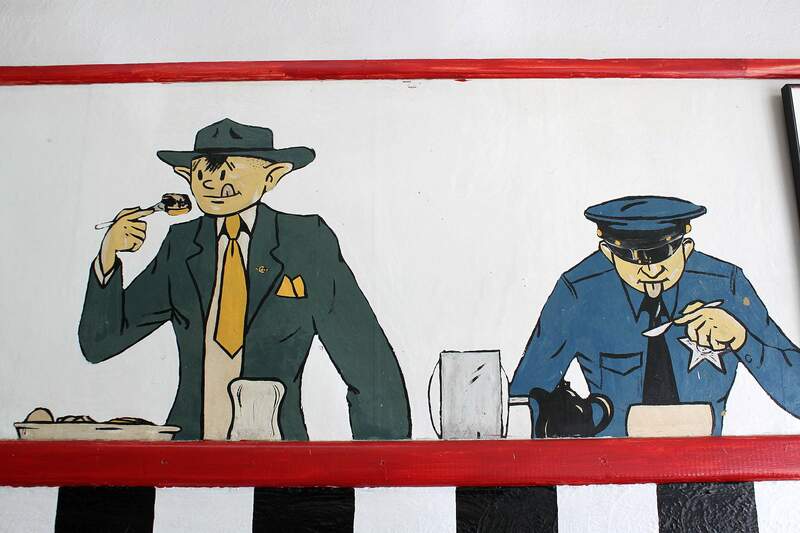 The artist, Bill Blake, modeled his caricatures after local residents, and Mae Prunty, one of the diner’s owners, claimed to have known every one of the artist’s models. 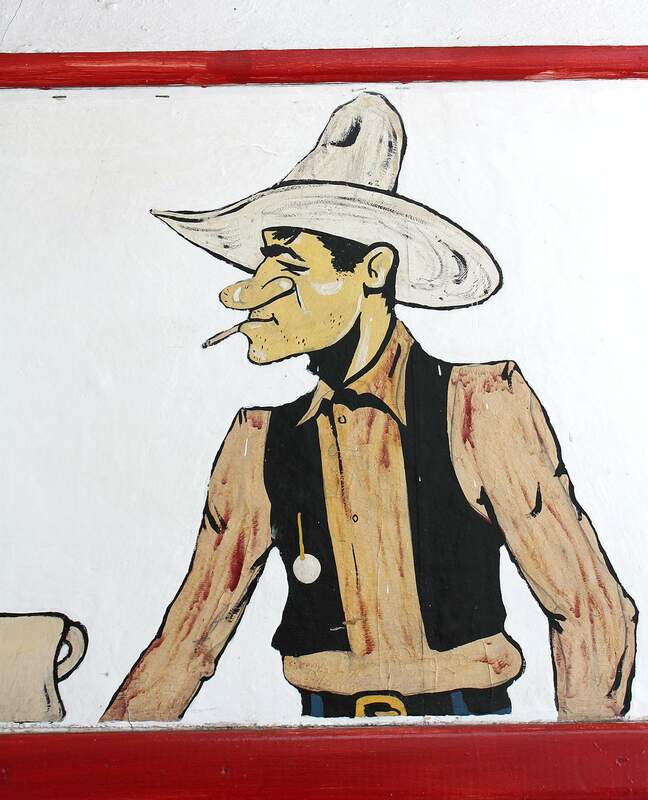 In a far corner of Mama D’s Deli, the artist Bill Blake, who had been arrested for stealing cars, painted a self-portrait in 1945. No one in Salida knows what happened to him when he quit doing odd jobs and left the café. Salida began as a train town, and Neil’s Café, which preceded Mama D’s, had a contract with the Denver & Rio Grande Railroad to serve trainmen 24 hours a day. 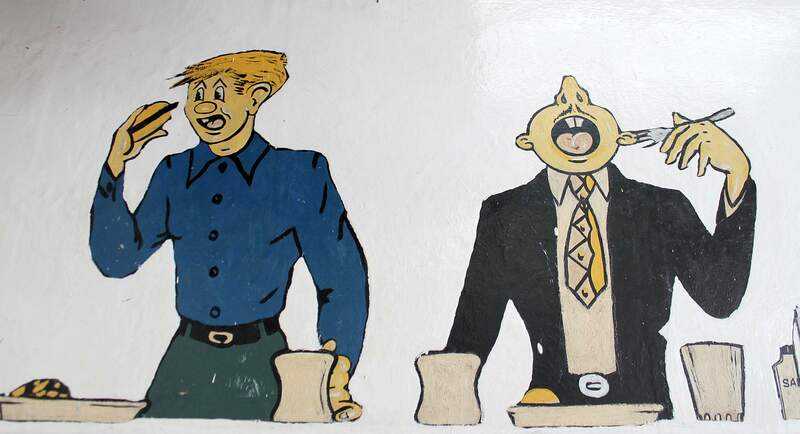 In this mural, a conductor and brakeman synchronize their pocket watches with a railroad engineer in his denim overalls. 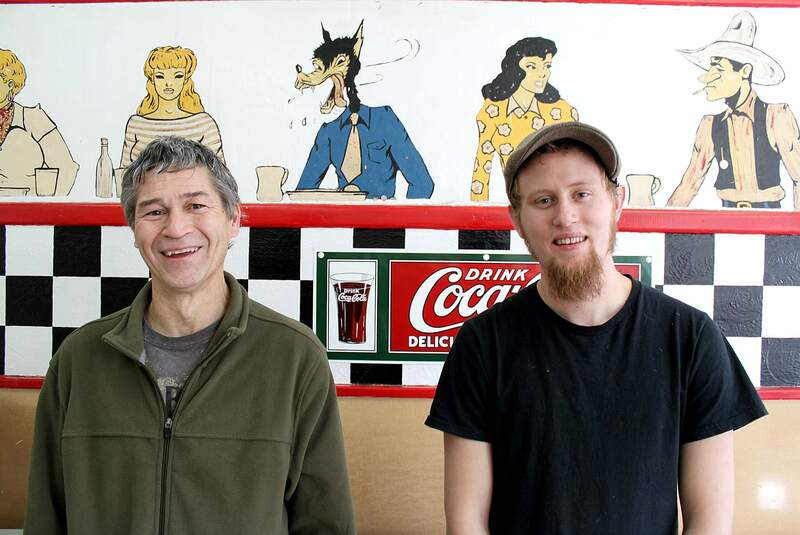 Mike Baker, left, and Jim Quinn are Mama D’s owners and cooks. They are dedicated local Salida businessmen who enjoy watching new customers come in and view the 1940s murals for the first time. The two owners have promised to protect the murals. The railroads would eventually lose freight business to interstate highways and 18-wheeled trucks. The Denver & Rio Grande Railroad tried to diversify and had its own Rio Grande Motor Freight Co. One of the drivers sits here with his white ceramic mug as a waitress clears the dishes. The murals in Mama D’s are realistic enough that you can almost hear the clink of spoons against coffee cups. A local cowboy with a broad-brimmed sombrero and a hand-rolled cigarette dangling from his lips, turns and faces the young ladies at the lunchroom counter. The streetside entrance of Mama D’s Deli in Salida, just a block and half from the Arkansas River, gives no hint of the 1940s murals that have been on display in the restaurant for 70 years. The building has always housed a restaurant. A well-dressed man, possibly a forest ranger, sits beside a Colorado state highway patrolmen clearly enjoying his soup. A teenager contemplates eating a burger in one bite. Beside him a man, clearly enjoying his food, has a mouth open large enough to see his tonsils. A regular patron of Neil’s Café is about to bite into her hot dog. 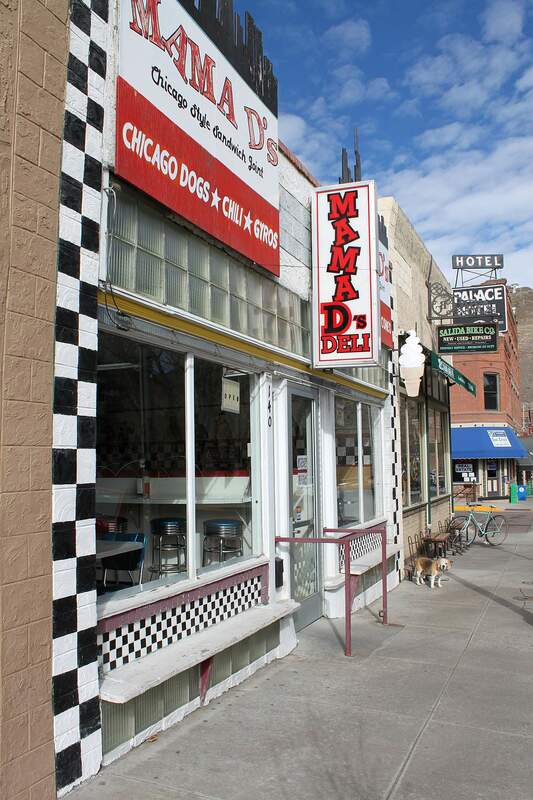 Now known as Mama D’s Deli, the restaurant specializes in chili dogs and Chicago dogs. SALIDA – Traveling around the West, when it’s mealtime I’ll eat anything – and I have. Friends tell me that I am blessed with an iron stomach and a tasteless palate. Perhaps. I was in historic downtown Salida in search of that quintessential road food – a chili dog – when I discovered Mama D’s Deli. I walked in to place my order, but what I found on the walls made me forget my hunger. I was captivated by what I saw. Lunch-counter patrons from the 1940s stared back at me. I had to smile because I had found a popular culture treasure in this old railroad town and a darn good dawg, too. Just a block or two from the Arkansas River and in the heart of Salida at 140 N. F Street, Neil’s Café, its name before Mama D’s, struggled through the Great Depression. Like Alamosa, Durango and Chama, the Denver & Rio Grande Railroad created Salida, a sooty town complete with coal dust, tired railroad workers and the occasional bindle stiff or hobo who walked down the tracks looking for handouts. With lunch-counter fare, Neil’s Café rode out the Depression thanks to loyal customers and teenagers who after school mixed malts and grilled burgers. Diners and cafés come and go across the West, but Neil’s, owned by Mae and Neil Prunty, had staying power. Originally the Rio Grande Café, named after the railroad, and then the Shamrock Café, as a nod to Irish railroaders, it became Neil’s Café. 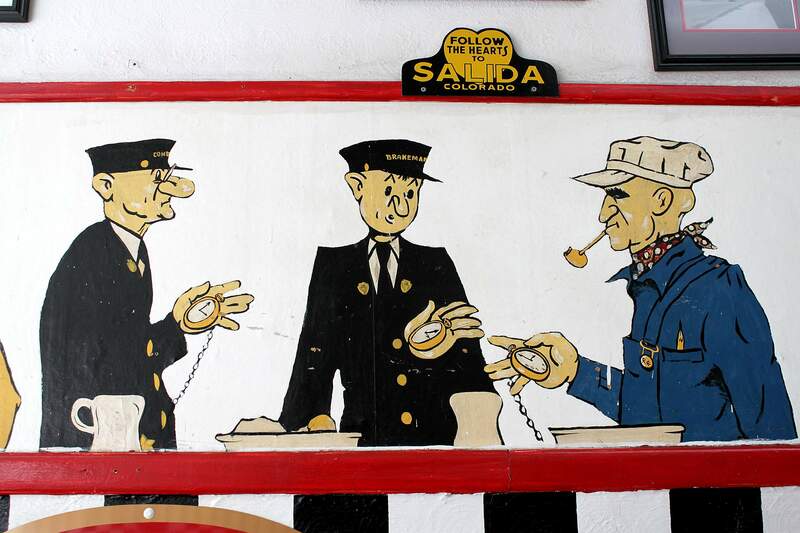 By World War II, “Salida was a booming railroad town, and the railroad paid the Pruntys a subsidy of $2,800 a month to keep the eatery open 24 hours a day to serve railroad employees,” said Arlene Shouard in the Salida newspaper The Mountain Mail. Then came the 10th Mountain Division and Camp Hale near Leadville with soldiers on skis. “Mae and her husband would get an order from the railroad that a troop train was coming through. They’d stay up all night cooking 300 hamburgers and fries plus hot pies for the troop trains,” longtime local David Arnett told me. In the middle of that hustle and bustle, in 1945, Neil Prunty hired Bill Blake to work at the café. Salida is a small town. Whether Neil knew that Bill had been arrested for grand theft auto remains unclear. Even though there were “mitigating circumstances,” Prunty gave a thief a chance, and in his spare time, Blake sketched drawings and cartoons of employees, customers and other characters. 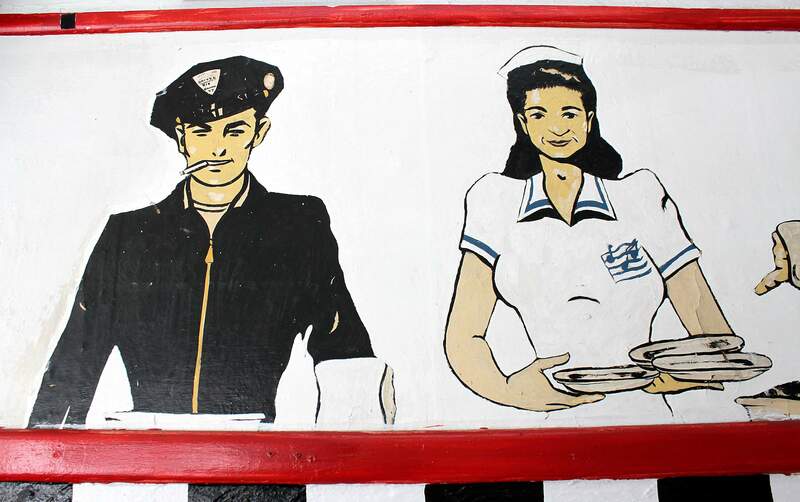 Seventy years later, his murals still adorn the diner’s walls. That’s what stopped me when I walked in to order my chili dog. I was entranced. All around the diner, men and women ate their lunches, chatted, gossiped and drank coffee. When I sat at a table, they looked at me across time and space and suddenly it was 1945, and I was dining with them. On one wall, a Rio Grande Freight motorman (now we’d call him a truck driver), his hat at a rakish angle, smoked his Pall Mall and sipped his coffee next to a well-coiffed waitress, plates in hand. A large panel portrays a railroad engineer, checking his watch, flanked by his brakeman and conductor with their pocket watches open. I can imagine how many trainmen ate in this diner decade after decade. Two beautiful single women, with full curvaceous figures and narrow waists, eat lunch. A wolf wearing a tie sits between them, spinning his head trying to decide which lady is lovelier. “I like the wolf the best, but the cop licking his spoon is pretty funny,” laughs Salida resident Julia Busse. “I like the wolf, too. He’s the only half animal/half person in the murals. People do a double-take,” says Mike Baker, who now owns the restaurant with John Quinn. “Hundreds and hundreds of local people have worked here, and we want to keep the tradition going,” says Quinn. Perhaps the Pruntys cooked all those hamburgers for Camp Hale troops on a woodstove. Almost hidden behind bags of chips is a face of a handsome young man, two artist’s paint brushes behind his ear. Just as stone carvers on Europe’s cathedrals etched each other’s faces on images of gargoyles, the mural artist at Mama D’s left us his self-portrait – in the corner, slyly looking at us across the years. I ate my chili dog, and I’ve been back for the Chicago Dog, which harkens to the Great Depression when in the Windy City you could get a hot dog on a bun with vegetables – all four food groups – for a nickel. 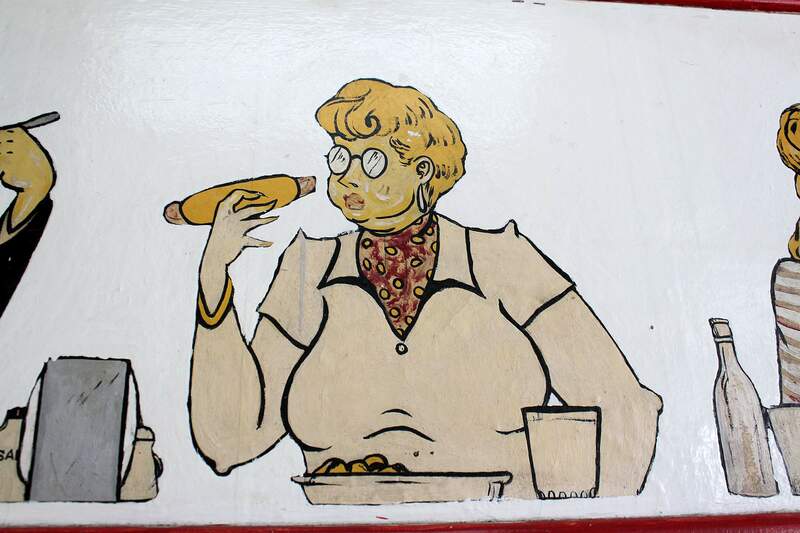 The Chicago Dog at Mama D’s costs more than in the 1930s, but the murals are still there. Unfortunately, the red is almost gone from the cowboy’s shirt as are the roses on the brunette’s yellow blouse. Next to her, the wolf’s red tongue and his businessman’s tie are losing their luster. On the wolf’s left, the buxom blonde in her scoop-neck Marseilles T-shirt wears faded color stripes. I hope the paintings can be saved. In Salida, the Durango & Rio Grande trainmen are history, but a new generation of mountain bikers, river runners and tourists need to visit Mama D’s. They should make friends with the former customers staring back from the diner’s walls.